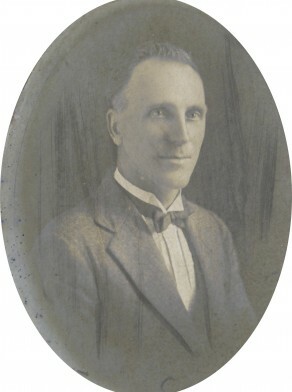 Charles Richard Harding was born in 1880, son of Robert John Harding and Elizabeth. In 1911 at Glebe he married Ethel May Barlow. There were five children of the marriage.He died at Annandale on 4 December 1953, aged 73 years. Ethel Harding died on 26 July 1962. Apprenticed to a compositor, and finishing his training as a typographer and book designer, Harding continued to work as a printer when elected to Council in 1920, and continued to do so until his retirement. Harding was a freemason, a member of Belmore Lodge No 57, and a vice-president of Glebe District Cricket Club and Glebe Rowing Club which he enthusiastically supported. Michael Hogan noted that Harding as a minority Labor representative was socialised into accepted patterns of behaviour among non-Labor men between 1920 and 1925. However after December 1925 as a protestant and freemason Harding and Francis Miller found themselves in uncongenial company, and both resigned from Glebe Council in March 1927. Charles Harding told Glebe Council in 1923 it was a shameful thing for returned soldiers to be begging on city streets to keep themselves from starvation. And he would not see them driven off the streets unless they were properly provided for. The preceding year a conference of suburban mayors proposed relief works for workless diggers. In 1924 Harding expressed his opposition to harsh penalties councillors proposedfor a spate of law-breaking.